Our newest generation wiring panel has arrived. This newly engineered fuse system known as the ACCESS 24/7 [patent pending] comes standard with 24 fuses and 3 relays, along with a unique mounting system and room for 4 additional relays. 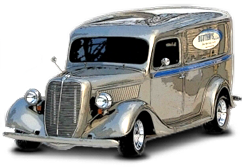 RON FRANCIS WIRING is now in our 34th year of high quality, extremely user friendly wiring systems for custom and upgraded automobiles. Our 18th generation, the ACCESS 24/7 covers all the bases and allows you to consolidate even additional aftermarket product's relays to really clean up the under dash board area. The “24” means fuse capacity, the “7” means number of relays it has the capacity to hold and the ACCESS 24/7 name is derived from the fact that you can actually reach under your dash board and bring the fuse panel out in plain view for checking a fuse, servicing, etc. There is so much to this small package it is hard to list. When you want to add an accessory or additional wires leading to the fuse panel, they simply plug in specially labeled connectors in the kick panel or behind upholstery. This is very similar to the terminal block design of the EXPRESS or BARE BONZ except they plug in instead. Talk about limited time under the dash. This works great! This fuse box measures only 5-3/"L x 3-1/4"W x 3-3/8"H! 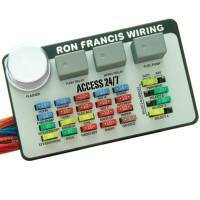 Ron Francis Wiring AUTHORIZED DEALER! MOUNTING: The ‘quick release’ magnet system will hold the panel under the dash until you need to check it. Just drop it down to work on it, since there is approximately 18” of movement in the wires for ultimate flexibility. Never has servicing a fuse box been any easier! ENGINES: We’ll make this system compatible with a Chevy, Ford, Mopar, or any other make of engine. We can build one for YOUR application. ACCESSORIES: Wiring is included and we give you the printed feed wires to plug into the color coded connectors located in the kick panel area. 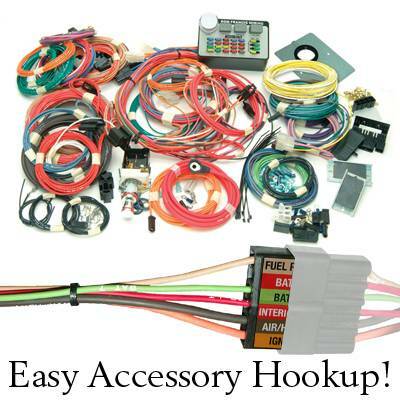 IGNITION SYSTEMS: Accepts the ignition systems of your choice: Stock/Original, MSD, Pertronics, Accel, Mallory and others. 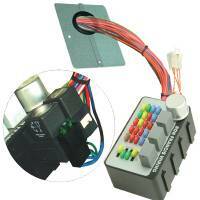 The wiring system that knows what you want to use and is easily accessible. 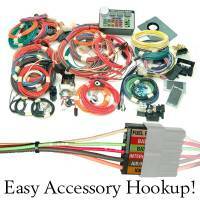 We'll wire it for a stock points system, HEI, or any other system at no extra charge. ALTERNATORS: RON FRANCIS WIRING supplies a minimum standard of 8 ga. wire for either stock applications, 100 amp units, or even higher amp units. We also offer 6 and 4 ga. wire for any alternator you plan to use - no extra charge. Many suppliers offer a 10 ga. (or less) alternator feed wire that cannot handle your new high output alternator. STEERING COLUMNS: We offer a large variation of choices of steering column connectors with your original stock column or buy one from Flaming River, ididit, GM, Ford, Mopar and or your local yard. *LED bulb replacements offered for any application draw less current then a regular incandescent bulb normally used. Since the traditional "can" flashers require a couple amps draw to flash, your system will now require a special low amperage flasher which can vary in price dramatically. Make sure if you have a combination of LED's and regular turn signal bulbs in the front or pull a trailer, you'll need a high quality unit that can handle this combination. To provide you with a kit that is made for your application and to expedite processing, please answer the following questions at the time of order. 1. What is your vehicle model and year? 2. What is your engine? 3. What is your distributor? 4. What column are you using? 5. Where is the location of your ignition switch? 6. Where is the location of your dimmer switch? 7. What alternator are you using? a) one-wire or b) original externally regulated? a) If one-wire, then no further info is necessary. problems that may be caused by original regulator.